I’ve been using my trusty Garmin GPSmap 76C with Simon Headford’s airspace maps (and Ben Friedland’s heights layer) for years now, however whilst it works ok I’ve always found the screen way too small and have thought for some time that there must be a better solution, especially since I now carry a portable computer, namely my iPhone, around with me the whole time. So I’ve been searching for the so-called “killer” airspace device/app for some time now, and whilst there are plenty of devices on the market (eg. 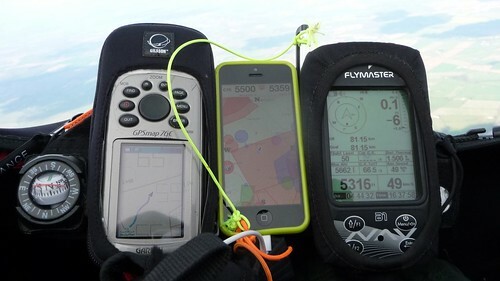 Garmin Montana, Airspace Aware, Vertica V2 + LK8000, or Galaxy Tab + XCSoar) they all involve forking out considerable amounts of money, something I’m reluctant to do if I can help it! On the iPhone front I’ve tried ThermGeek (ok, but not optimised for in-flight operation and no airspace warnings or any way to easily see airspace heights) and I’ve eyed up but not bought Airspace Aware and RunwayHD, and so when I heard about Flyskyhy on ParaglidingForum.com I contacted the developer, René Dekker, to ask if I could have an evaluation copy to test and review before purchasing. He was only too happy to help and so back in mid February I downloaded it and started having a play. The version I was given had the airspaces and waypoints extensions already enabled – you would normally have to pay an additional £3.99 for each of these – but at £11.97 total cost it’s still very good value. You should budget for both of them as they are both essential for serious XC pilots. One thing immediately stood out, and that was that you couldn’t zoom far enough out on the main flying screen, so I sent a quick email to René and a short while later he sent me a new file to download and install which fixed this. It was the same story with height units – initially they were just in metres – but he was already aware of that and fixed it very quickly. The point of mentioning this is not to draw attention to any shortcomings, but rather to highlight the fact that the app is being actively developed and improved. Now I could have spent ages taking screenshots and writing about all the features, but instead I’ve created a short video which runs through the most important ones. I hope you’ll agree it explains things far better than I could have described it in longhand! So that’s what it’s like on the ground – what’s it like in the air? In a word, excellent. The screen is bright and the map is very clear and uncluttered, and it’s all really easy to use with a capacitive stylus. Airspace proximity alerts flash up when you get within the distances you specify in the settings, and you can’t ignore them due to the loud klaxon alarm that sounds! They stay on screen for a few seconds before disappearing, leaving you free to zoom in and concentrate on navigating around them. I tend to turn the screen off to save the battery when I know I’m nowhere near airspace, then turn it on again when the Garmin shows that I’m getting close, but during recent long flights (3-4 hours) with the screen on most of the time, my 10,000mAh external battery was at about 50% at the end of the flight. On my recent 6 hour flight I had the screen on for perhaps 30% of the time and again the battery was at 50% when I landed (and the phone at 100% of course). I should say at this point that the app has to be running with the screen on at the beginning of the flight in order for it to recognise the start of the flight (and hence start logging), but once the flight has started you can open other apps (eg. texting from the air 🙂 ) or turn the screen off. (Incidentally, making calls is really easy with the phone mounted like this and the hands-free audio works well for both parties). The iPhone is in a super-cheap eBay gel case with two strips of sticky-back velcro stuck on the back of it. It’s very secure, however I do of course attach it to the instrument panel with a lanyard! (And I also attach the whole removable instrument panel to the cockpit with some spare Brummel hooks on short lengths of line. I didn’t mention the thermal tracking in the video, and to be honest I haven’t paid much attention to it in flight. But if you notice some blue blobs appearing, then that’s where it predicts your thermal will be, and red blobs indicate areas of sink. I know this sounds counter-intuitive, and I have mentioned it to René, but he has his reasons for keeping it like that! As for how well it works, I can’t really say. I think the drift is being calculated in an over-complicated way, and René says he’ll think about changing it so that it records the areas of strongest lift at a given altitude, so that if you fall out of the thermal and lose 100′ say, then the screen will show you where the lift was at that altitude. As it is I have my Flymaster B1 Nav for this which is why I haven’t been paying much attention to it. Also, I haven’t paid any attention to the wind calculations or other instruments (apart from Altitude and Altitude Limit) as my B1 Nav tracks windspeed and has a very sensitive barometer so will measure lift/sink far more accurately than the iPhone GPS will allow you to do. So I’m using it purely as a navigation tool rather than a replacement GPS-vario. Regarding the sources of the airspace data files used by Flyskyhy, René integrates them within the app himself – ie. you can’t specify the files yourself. However I’ve been working with him to provide an accurate and up-to-date UK file based on the latest UK OpenAir file on SoaringWeb, which appears to be the best source of airspace files. My latest modification is to classify all the small microlight strips as Class “ML”, which appear in Flyskyhy in the “Others” category, so they can then be turned off if desired. The app checks for updated airspace files once a week so any updates will filter through pretty quickly. Incidentally, Flyskyhy is designed for international use, not just the UK – I understand it incorporates airspace for 27 different countries, and it was certainly very useful for avoiding the Aiguille Rouge airspace in the Chamonix region during my trip there last month. 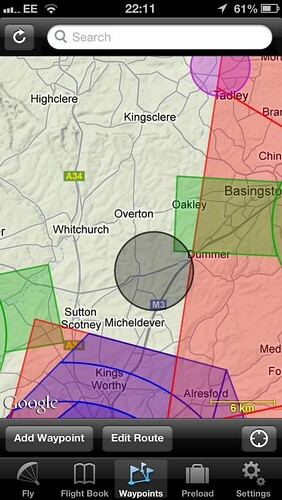 Popham shown as a black circle – we can enter it! What I don’t want from a flight-direction up mode is for the map to start spinning round when I’m thermalling as I find that very confusing, but if, when thermalling, it kept the map locked in the direction of the last glide, then it could be useful. He’s also trying to get elevation data into the app, so that it can support AGL airspaces better (currently it does an educated guess based on the nearest landing spot). Elevation data will also enable an “Altitude above ground” flight instrument (and a nice presentation in the flight graph instrument). So to summarise, Flyskyhy is an excellent tool for airspace navigation, especially given the UK’s complex airspace, and I for one will stop searching for that elusive “killer” app as I believe I’ve finally found it. ~ by Tim Pentreath on May 15, 2013. Thanks for the excellent article, Tim. Is there a different URL that does work? Thanks for great review Tim – Just downloaded and ordered one of those backup batteries. Don’t forget a capacitive stylus – pack of 10 for £1.99 on eBay! Hi Mark, the case I use has a hole cut out for the headphone socket and the USB socket so I just loop the lanyard through it. Thanks Tim. The other things I meant to ask were how legible is the screen in sunlight and do you have to adjust the iphone’s settings to prevent the screen switching to sleep while you fly? 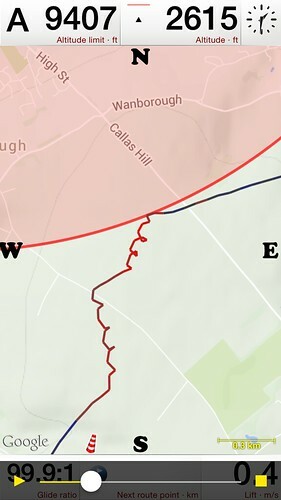 The map page is very clear (if using Google Terrain background map) so the airspace overlay is easy to see on top even in bright sunlight. Let me know your email address, or text me (see contact page), and I’ll send you some screen shots. Then just go out in the sun and see for yourself 🙂 But I’ve not had a problem reading it in sunshine whilst wearing sunglasses. And no, the screen will stay on for the duration of the flight if Flyskyhy is the foreground app. If you switch to Messages to answer a text (I’ve done this a few times now! ), then if you leave it on the Message app then the screen will go off as normal, although FSH will keep recording your tracklog and sending out livetracking if you’ve got that turned on. Great article, I’ve just recently been trying XC soar, I am very interesting in this system. Do you think it would work on an ITouch? I’m just thinking of a dedicated instrument instead of having to use a phone. Hi James, no it won’t be much use on an iPod Touch as it doesn’t have a GPS. Great review I must agree!! Maybe here comes the most stupid question: With this app , do you need connection to the internet (3G?) I suppose not, but have doubts, because of the possibility to track your friends by lifetrack24.. I think livetracking will work if you have GPRS or Edge connection, so to answer your question properly, 3G isn’t necessary, but a data connection IS necessary. Tx Tim, meanwhile, I found out that only data connection is necessary when livetracking or with airspace extensions. Great App !! Hi, I need to know if the Flyskyhy app for iOS supports the barometer of the iPhone6 and iPhone7. That should replace an external variometer in order to measure accurate vertical speed. Hi Tim, I have a Samsung phone and had been trying to resist an iPhone. Would you recommend an iPhone 6, 6S or 6 Plus or something else now? Possibly refurbished? Hi John, depends if you’re only going to use it for flying. If so, then if the screen size of the 6 is ok for you (it’s what I use), then use that, or get the 6plus if you want the bigger screen. But you’ll get a 6 or 6plus off eBay for not a great deal of money. And you don’t need lots of storage if it’s just going to be a flying instrument.